Around five years ago, Rana Dikko’s husband was shot and killed in Idlib, Syria, when she was pregnant with their third child. “A soldier behind him yelled to step away, but he was deaf, so he didn’t hear him. He was shot dead,” she said. “I was so traumatized by the constant heavy shelling, my husband’s death and being a pregnant mother alone, that I couldn’t produce milk when my baby was born. I used to give him a mix of tea and bread,” she said in Arabic about her son, Mohammed. He is now 4, but looks much younger than his real age because of malnutrition and traumas during his early childhood. Four months after his birth, Dikko paid a smuggler to take her, her children and her sister-in-law through the mountains across the Turkish border. Today, Dikko and her children live at the largest shelter for Syrian refugees that is run by Syrian refugees, the Selam Center, which first opened in early 2013. Already at that time, the constant airstrikes pushed many Syrians, especially women and children, to cross Syria’s northern border into Turkey, where today 3.5 million Syrian war refugees live. For hundreds of Syrian widows and unaccompanied minors, Selam has been a point of reference in the past years. Now, a lack of funding could lead to the closure of the shelter, the only safe space of its kind that was created and run by refugee women for refugee women — a strategy that has helped strengthen bonds and trust among traumatized mothers and children in exile. The Selam Center was independently founded by two Syrian refugee women without the help of the Turkish government. Their initial goal was to help a small number of the displaced children who had lost their father or both parents during bombings or ISIS kidnappings. However, the need to widen their scope quickly became evident when the center grew from hosting 15 children to 45 within its first year of operations, thanks to word-of-mouth recommendations. “We began receiving requests from vulnerable families [temporarily hosted] at other centers, and didn’t refuse to welcome them despite our limited resources,” said Hanan Ahmado, a volunteer assistant at Selam. According to Save the Children, around 202,300 Syrian kids live in what the United Nations considers besieged areas. At least 100,000 of them are orphans, according to some estimates. Located in Gaziantep, a city in southeastern Turkey and two-hour drive from Aleppo, Selam’s building currently hosts 55 families in 63 small flats for a total of over 200 beneficiaries. While generally the disadvantaged refugees residing in the city receive the assistance of international NGOs — which have opened satellite offices en mass since 2013 — Selam in particular sets an example of Syrian refugees helping themselves without external assistance. Dikko said that without the help of fellow displaced women coming from Syria who understand her challenges because they’ve also experienced them firsthand, she wouldn’t have known how to enroll her children in local Turkish schools. She believes that will offer them a better future than what they could expect in Syria. Shyly asking not to be photographed, she said she is optimistic about the future for her 9-year old daughter, now fluent in Turkish and excelling in her studies. Thanks to the sense of community developed inside the shelter, Dikko’s been able to feel at ease again, after years of mental restlessness. So far the center has kept its doors open thanks to occasional individual donors and the charity of Syrian civilians, but as the number of residents increased, so did rent and bills. Ahmado herself has been a full-time volunteer in the past year and receives only a few hundred dollars a month as remuneration for her work. A refugee from Damascus, she moved to Gaziantep a year and a half ago, and thanks to the financial support of her family, still safe back in the Syrian capital, she’s managed to survive without taking any other jobs. Muhammad Damour, Selam’s only male board member and son of one of the founders, hopes they won’t be forced to close down. “That would mean to send over 200 people to refugee camps, or to their relatives, in the rare eventuality they have any here in Turkey,” Damour said. With Selam’s residents now facing an uncertain future, the staff fears that all the efforts made to provide education, employment assistance and mental health relief will be vain if these women will be forced to leave and start over — again. “We taught them [the concept of] dignity as well, because it’s easy to be exploited as an Arab woman and refugee alone in a foreign country with no husband,” Ahmado said. Sajida al-Mustafa, another Syrian widow, sits on the floor of her tiny living room while sipping from a cup of freshly-made Turkish coffee. She smiles at her three young daughters, who look tired, as they wait for the school bus to pick them up. Al-Mustafa, 45, comes originally from Deir ez-Zor. She fled her ISIS-controlled hometown two years ago and is now living at the center. As al-Mustafa’s daughters finish packing their school bags, their mother regrets leaving Turkey the first time she came. “My husband and I didn’t like living here, to be away from our beloved country. So we took the risk and went back. And that’s when he died, under the coalition’s airstrikes that hit our house,” she said. 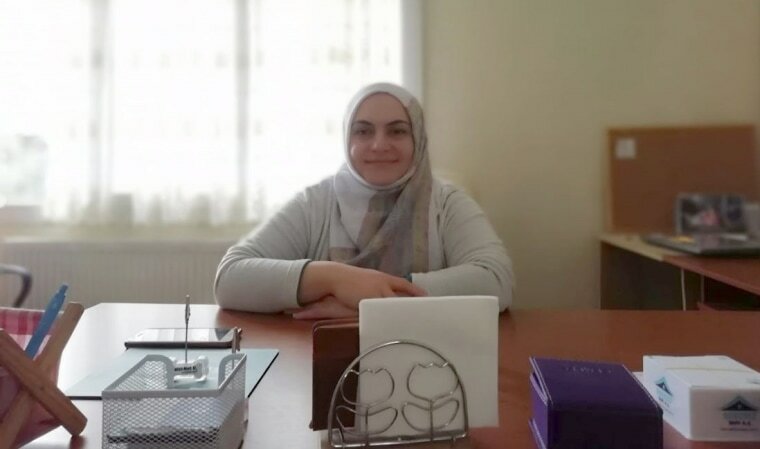 After the 10 days of mourning required by Islamic religion, and thinking of her daughters’ safety, she immediately began preparing to illegally cross the Turkish border, again. She promised herself she was not going to lose them as well. While holding back tears, she said she no longer sees a future for her girls in Syria, even in the case of a definite ceasefire. Stefania D'Ignoti is a freelance journalist based in Sicily and the Middle East.